Automatic Identification System (AIS) data that tracks ships at sea shows that dozens of ships are standing still unable to move through the Kerch straits that join the Black Sea to the Sea of Azov after Russia’s coast guard rammed a Ukrainian naval tug at the weekend, sending Russian-Ukrainian relationships to a new low. Tensions have flared after a Russian coast guard ship rammed a Ukrainian tug trying to traverse the passage. The Ukraine navy said the tug and its two accompanying patrol boats were on their way from the Ukrainian port of Odesa in the west of the Black Sea to the port of Mariupol on the Ukrainian coast in the Sea of Azov. Unconfirmed reports claimed that 35 vessels have been prevented from traveling through the straits and are waiting at sea. 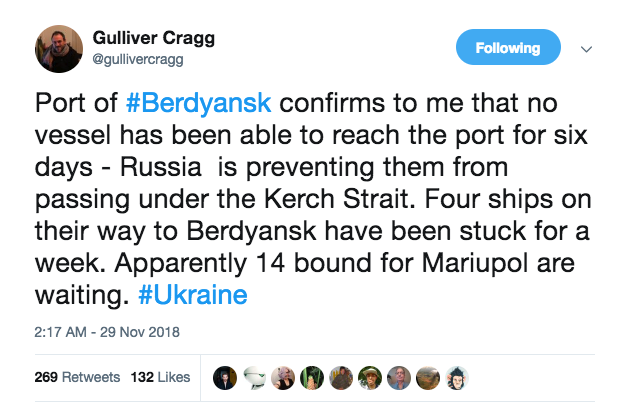 Reports on social media claim that in effect the two Ukrainian ports on the coast of the Sea of Azov at Berdyansk and Mariupol are effectively under blockade. Only vessels headed to Russian ports in the Sea of Azov have been granted permission to pass through the straits, according to the same unconfirmed reports. A blockage of ports is technically an act of war. 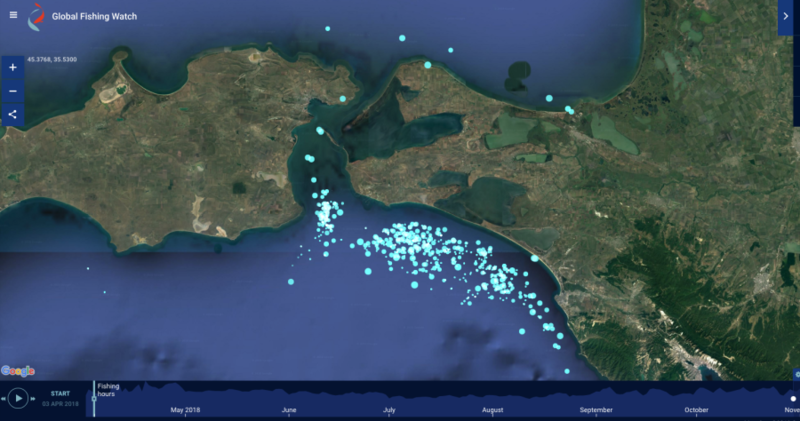 AIS data clearly shows that over the summer and into October the seas around the Kerch straits were clear of shipping, however, this data is the average over a month. But in November the number of ships waiting to traverse the straits rapidly builds up. This data is from the site Global Fishing Watch that records AIS data sent by vessels, but other AIS data shared on social media paints a similar picture. Currently the AIS data also show only six vessels in the straits themselves, all registered under Russian flags, which are presumably Russian coast guards preventing anyone from entering the channel. 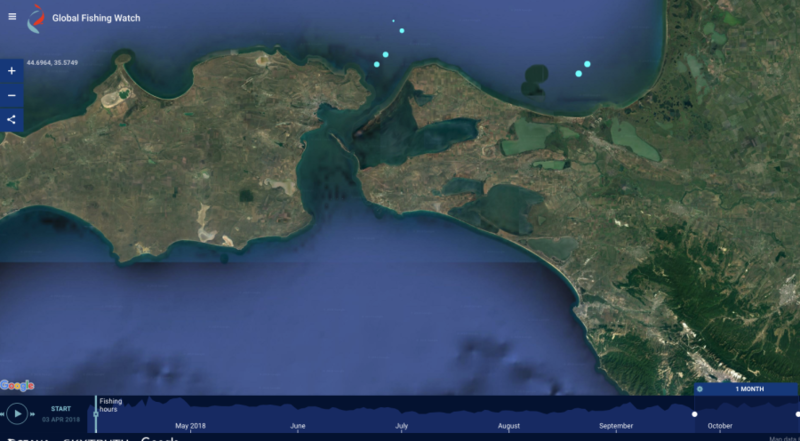 The tracking data for this year of the two vessels right under the Kerch bridge itself show them both sailing back and forth in front of the entrance to the straits on the Sea of Azov side and then sailing in and out repeatedly from the Russian port of Novorossiysk. Presumably these are Russian naval patrols, although they could be fishing boats. The ports on the Sea of Azov play a crucial economic role and are responsible for up to a third of Ukraine’s grain exports, one of its few hard currency earners. The Ukrainian government warned that grain exports this year may fall because of the tensions in the sea, acting Ukrainian Agriculture Minister Maksym Martyniuk said on November 27. Ukrainian farmers have harvested a record 30mn tons of grain so far this year and 16.6mn tonnes have already been exported from the total of circa 27mn tonnes that were expected to be exported this agricultural season. Separately, Ukraine’s authorities also banned all foreigners from crossing into Crimea by land, which includes members of the international media. Any foreign press wanting to visit Crimea will have to fly into the peninsula from Russia, which violates Ukrainian law. The European Union has had a ban on its diplomats visiting the peninsula since 2014. Under the terms of a 2003 agreement Ukraine and Russia both have guaranteed right of passage through the straits, however, the Russian coast guard administers the waterway and has been harassing Ukrainian shipping with frequent inspections all year. Following the incident on November 25 Russia briefly blockaded access to the Sea of Azov by parking a tanker under the newly constructed bridge. However, the tanker was later removed. The incident has caused an international outcry and claims that Russia is preparing to invade Ukraine again. President Petro Poroshenko called for the imposition of martial law that went into effect for 30 days at 9am on November 29, and is due to finish two days before the official start of campaigning for the March 31, 2019 presidential elections. For their part the Russians sent their highly advanced S400 missile defence system to the Crimea to “protect the skies” in what is more of a symbolic move than anything else. It remains unclear what caused the clash. While video and audio evidence clearly show the Russian ship hitting the Ukrainian one, seemingly on purpose, the Russian side say the Ukrainian ships did not ask for permission to traverse the straits, which is required for safety reasons, while the Ukrainian side say they did hail the Russian port authorities at Kerch but got no response. Poroshenko spent this week giving interviews to international media and has called on Nato to send ships to the Black Sea to guarantee Ukraine’s sovereign integrity. On November 29 US President Donald Trump abruptly cancelled his own planned G20 meeting with Russia’s Vladimir Putin slated for this weekend, blaming Russia’s failure to return the three ships from the weekend incident that have been seized by Russia including their crews.